Last week we visited family, and always right before we head out the door my mom makes sure I bring something home…food-related of course! My family lives in Pennsylvania Dutch country, so they frequent their local Amish market and my mom always buys way more than she needs (hmm, wonder where I got that from!). This time she made me bring home some zucchini which I decided to use for baked zucchini fritters. 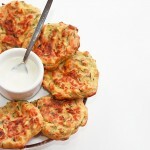 I love fried zucchini fritters, but wanted to make a healthier baked version. This recipe is very easy to follow and uses whole wheat flour in the batter, but regular flour is just fine. 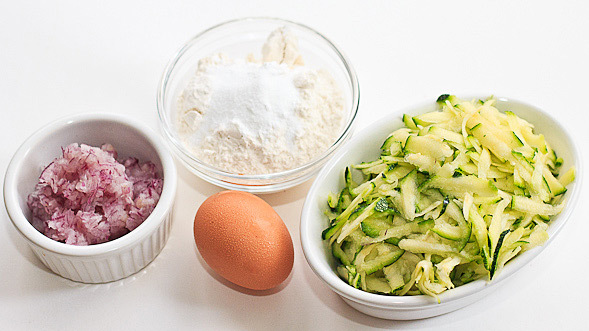 Make sure after you grate the zucchini and onion, to squeeze out the excess liquid. It will help keep the fritters nice and crisp. 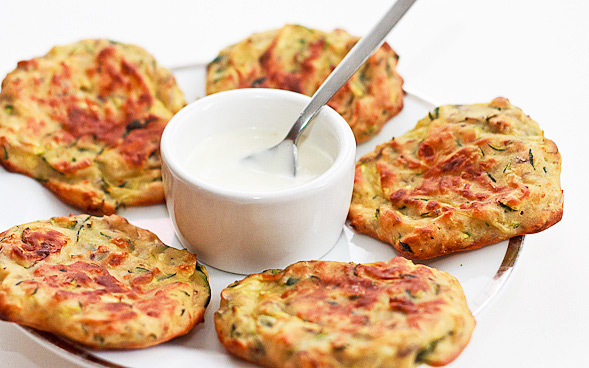 Serve these with homemade garlic mayonnaise or your preferred dipping sauce. 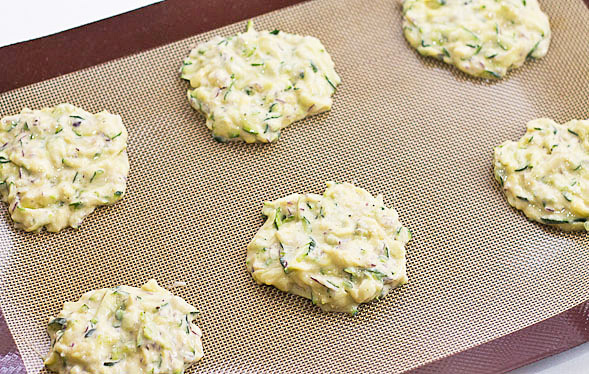 Grate the zucchini and onion, then squeeze out the liquid with a paper towel. Place in a bowl, then mix together with flour, salt, pepper, egg and milk. Bake for about 20 minutes, then flip and bake for another 10 minutes on the other side. Serve with garlic mayo or your favorite dipping sauce. Heat oven to 425°F. With a grater, grate zucchini and onion. 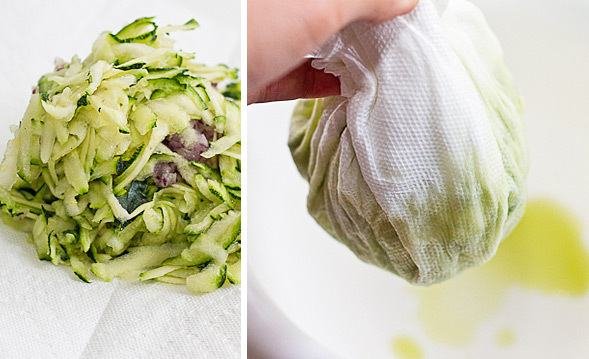 Place grated zucchini and onion in paper towel or kitchen towel and squeeze out liquid. Add to a bowl and combine whole wheat flour, salt, pepper, milk and egg, mix well. Drop small to medium-sized rounds on a lightly greased baking sheet or lined with Silpat. Bake for 16-20 minutes, depending on the size of your fritters. Then flip and bake for another 10 minutes until golden brown on each side. Enjoy with garlic mayonnaise or preferred sauce. Oh my goodness! 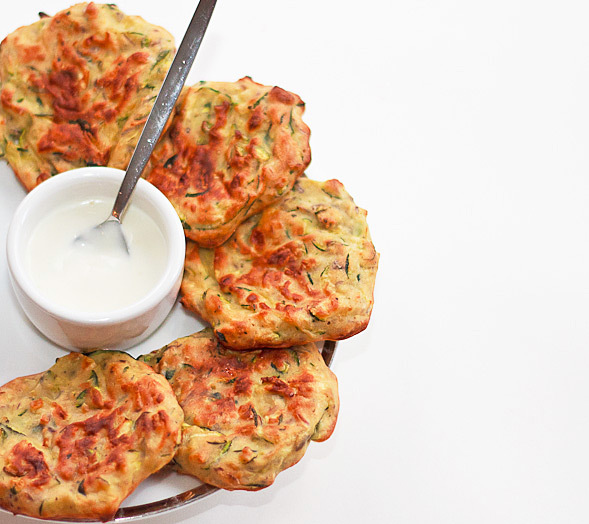 These fritters look soooooo good. I can’t wait to make them. I LOVE zucchini! Thanks so much, Joan 🙂 I love zucchini too! They look wonderful! I’m definitely going to keep this recipe in mind. Great 🙂 Thank you, Joan! I made these fitters last night and loved, loved, loved them. Love that I dont feel so guilty eating them either. I had them with Wishbone’s light buffalo ranch dressing. I will be making this recipe alot. Its my new favorite! I am dying to make this recipe tonight and I was thinking of halfing it. I have one ENORMOUS zucchini, so I was wondering what the cup measurement equivalent is? Thank you! Sorry for the delay, if you haven’t made it yet I would just use your one zucchini. I used two large ones. Try to get a thick pancake batter consistency and you should be fine. Lt me know how it goes. It would be helpful if the zuchinni was measured in cups instead of size. I made them and they were really gooey after 20 minutes- so I flattened them and put them in for another 10 minutes. They were still weren’t brown. I have no idea how you got yours as brown as the ones in the picture. Hi Kimmie – Thanks your your comment! Sorry yours didn’t turn out too well. Hmm, did you make sure to squeeze out the excess liquid from the grated zucchini and onions? Also, baking times could be different depending on the oven. Next time I make it I’ll make sure to test this recipe out and see what the measurement is in cups. WOOW, IT LOOKS SO GOOD! im thinking – how many kcal does it have? Thanks! For 4 servings it’s about 99 calories. Hello. These look absolutely delicious! Zucchini can be difficult to find here haha are there any alternatives I could use? Also I’m just curious (as a very conscious and cautious person aiming for weight loss) but approx how much calories does each serving consist of? Hi Kira – Any kind of squash would work and try out aubergine/eggplant, pumpkin or carrots. And 4 servings is about 99 calories. Hope this helps! Can you serve them cold? I have a party of 30 people. Was thinking about making them? I followed the recipe but I used gluten free self raising flower which I usually make with fried fritters without any problems. My fritters did not turn out as golden as the photos and turned out very thin and too crispy on the edges? I think I will go back to my fried fritters recipe! I also sub it chick pea flour for wheat flour with a little baking powder for our gluten free friends, nice texture and taste. These were really good when I made them. Since zucchini is pretty mild, I may try adding some extra flavour with some grated parmesan and They would be good this way with a marinara type dipping sauce. I had no problem with them browning, but I think the key, as you said, is to make sure vegetables are really dry before you mix them into the batter. An easy way to do this is to press them in a potato ricer, if you have one. (Also works for squeezing frozen chopped spinach dry) Thanks for the great inspiration! Hello. I tried a vegan version – flax egg and a splash of coconut milk – and they turned out delicious ! Thank you for your recipe. I looove zuchinnis ! Hi Ana – The addition or coconut milk sounds delicious, I’ll have to try that out sometime! Tried it out today as a friend gave me some zucchini from her garden. It was so good.l added a pinch of chilli poweder as we eat spicy. It was delicious. Thank you! Any status on the cups of zucchini needed? I frozen some from my garden and have it froze in 1 cup increments and everyone has a different definition of large (sorry that is the science teacher in me). I have also found it is easier to remove the water after it has been frozen. Hi Amy – So sorry for the late response! Your message was in my spam folder for some reason. 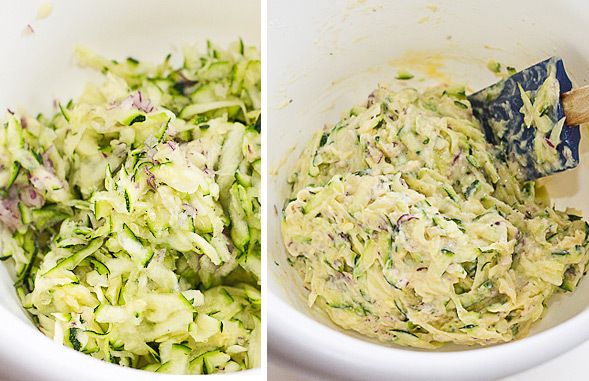 Try using 2-3 cups of the zucchini. Hope you enjoy the recipe! Can almond flour be used. Not able to use flour or wheat flour. Hi Chris – Yes sure, I don’t see why almond flour wouldn’t work. Let me know how it goes!